Less than two years after graduating from UC Riverside, Neftali Galarza is a public official. In fact, he may be the first UCCS alumnus to hold public office. In November 2017, Neftali was appointed to the Coachella Valley Unified School District Board of Trustees, replacing an elected member who had been forced to resign. As an appointee, Neftali serves in the nonpartisan office until the next election, when he must run for the post on his own. His campaign already is underway, however, with that election set for November. 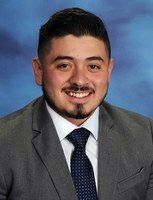 Neftali’s path from student to public official began at UCCS where, as a California Endowment Health Justice Scholar, he focused on issues related to a health-care district while an intern in the Capitol office of his local assemblyman, Democrat Eduardo Garcia of Coachella. Connections made during that spring quarter helped Neftali secure work in Garcia’s district after graduation, first as a field organizer for the Southwest Voter Registration Project, then as program coordinator for the Council of Mexican Federation and currently as director of community outreach for the California Alliance for Renewable Energy Solutions. More important to his public role, his internship gave him a deeper awareness of health and education issues in the Riverside and Imperial County region where he grew up and which he now serves. He also credits contacts made through his time at UCCS for securing his first job with the Voter Project where he registered voters and managed get-out-the-vote efforts.